This is the essential guide how to seed a chili without discomfort. When I talk about chili preparation I also mean chile and chilli, there's a variety of spellings depending on where you live. You're in the middle of seeding a chili and you get the urge to rub your eye. Subconsciously you rub your eye and the next thing you know it's on fire! How many times have you done that? I used to do it all the time until someone gave me this fabulous tip of how to get the seeds out of a chili without fear of that burn. Simply chop the stalk end off the chili and then hold the chili vertically and rub it between the palms of your hands - just watch the seeds fall out. After that you can chop to your hearts content either into rings or finer by taking the knife tip in one hand and the handle in the other a rock it over the chili. A large knife is better for this. Contrary to popular belief, the chili seeds are not the hottest part of the fruit. Yes they are hot and removing the seeds will reduce the intensity of heat from your chili but if you remove the seeds from your chili as described above this simply solves the problem of inadvertently getting a chili irritation in your eyes or mouth. The hottest part of the chili is the connective tissue between the seed and the outer casing. So if you want to reduce the intensity of your chili heat then the only way to do this is to slice your chili in half length ways and scrape out the seeds together with this connective tissue. 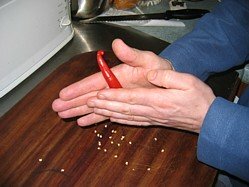 If you choose this method how to seed a chili then just remember to wash your hands thoroughly immediately after handing the chilies. Finally just to clear up the spelling point. Any of the ways I have spelled it are fine, it just depends where you come from. Technically chili is the original, chili is a corruption generally used in North America and chilli is the European corruption. So in short, don't worry about how you spell it, just chilli out and relax! 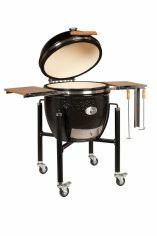 Click below to see cooking tips from other great BBQ chefs.